Do you send Christmas or Holiday cards? I started sending them when I was a kid and even on into my twenties, but then I quit doing it for a very long time. NOTE: I still have an example of one I sent as a kid -- it's pink and has a Bijorn Wiinbladt-looking angel on it. Purchased at Neiman Marcus, natch. NOTE to NOTE: Remember when Neiman Marcus put their name on everything they sold? Even designer clothing got an additional NM tag sewn (later stickered) inside. I loved that. Wish they still did it. I'm not sure why I quit sending them in my twenties and thirties. Of course, it was more difficult to send a card then since it cost more to have them personalized and of course there was no such thing as excel labels. Plus, I guess my friends quit sending them too. Let me make it clear that I never stopped loving Jesus and continued to shed many tears over Its a Wonderful Life and Charlie Brown. I just quit sending cards at Christmas. Anyway, probably 10 years ago I started sending them again. I think that it was because I loved seeing the photos of people's families on them and (being a theatre major) I have never minded putting out "publicity" about myself -- so I liked the idea of having an excuse to send out a picture of myself that I got to choose and "sentimize" myself. NOTE: Not sure that sentimize is a word. If not, I need to sell it to Tyra Banks. ANOTHER NOTE: By the way, Joe hates this publicity-seeking side of me, but cry me a river, babe. I think I'm hilarious and I am unanimous in that. NOTE to ANOTHER NOTE: Mrs. Slocum reference -- I got a million of them! So you're probably thinking "Get to the point -- why do you hate them?" and I don't blame you. I hate Christmas cards because I have a terrible time throwing them away. I keep them for years. Need to know what your card looked like 5 years ago? Come over to my house. I have them in scrapbooks, hole-punched and tied with a ring, in a silver bowl in the living room, just everywhere. 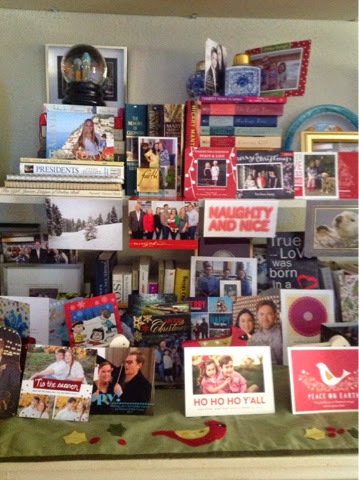 The photo above is this year's display and this is early on, people -- I'll have to get out the ladder in a week in order to display them around the den. You did this to me. Also, the cards and how they come to me kinda piss me off because it makes me realize what a shallow person I am, yet they also make me feel guilty. Don't understand this? If people use labels instead of hand-addressing them, I judge them. If they actually write something to me inside the card and hand address them, I know they are judging me. Ugh. Hey, not sure why I'm telling you this, but I'm having lots of fun at home this morning receiving Community Partners of Dallas' Toy Drive wishes, so I guess since I'm having so much fun "working", I felt the need to confess something to you all. Merry Christmas, friends -- and keep those cards coming! Loved this. I feel so guilty. I know, Phoebe! I just received one with a handwritten note to me inside, on a card that helps a charity, with an actual photo of the beautiful family pasted into the card. Do I even need to say it was hand addressed? The time!